If any one make a mistake in the recitation of Psalm, responsory, antiphon, or lesson, and do not humble himself by making satisfaction there before all, let him be subjected to severer punishment, as one who would not correct by humility what he did wrong through negligence. But children for such faults are to be whipt. The monk is God’s “own workman in the multitude of the people” (Prologue); his work is the Opus Dei, the Work of God. To this work, the monk prefers nothing whatsoever (Chapter XLIII). The Divine Office is a specialised work. Not only does the Divine Office require a real preparation, which consists, principally, in the study of the psalms; it also requires a constant attention to detail, and and willingness to learn and always to review the various texts and ceremonies of the Divine Office, so as to enter with body, mind, and heart into the prayer of Christ and of His Spouse, the Church. Thus will we fulfil what Saint Benedict says in Chapter XIX: “Therefore let us consider how we ought to behave ourselves in the presence of God and of His angels, and so assist at the Divine Office, that our mind and our voice may accord together”. The study of the Psalter is not like a university course, something that a man completes in order to move on to the next level. A son of Saint Benedict will never finish studying the Psalter. 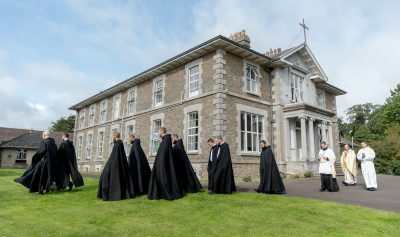 The monastery is, according to Saint Benedict, the “school of the Lord’s service” (Prologue). As such, it is in session seven times a day and once in the night, seven days a week, and every day of the year without exception, and this over a lifetime. Application to the study of the Psalter bears fruit in every area of a monk’s life. To be a monk is to be a man of the Psalter. The psalms are a monk’s daily bread, his manna in the desert. A monk rises in the morning and falls asleep at night with the psalms on his lips. The chant of the psalms constitutes the regular heartbeat of the monk’s day. Semper in Ore Psalmus, Semper in Corde Christus. Always a Psalm on the lips, always Christ in the heart. The Son of God, whom Saint Gertrude calls the Cantor Patris, the Cantor of the Father, intones from the high place of the Cross the psalm that he knows will be continued by the little nucleus of the Church, gathered at His feet: His Mother, Saint John, his dearest friend, and Saint Mary Magdalene, the lamb whom He rescued and filled with an astonishing love. In intoning this psalm, Our Lord leaves His Church with the prophecy of His resurrection, His universal kingship, and the gift of His adorable Body and Blood until the end of the age. Then, in the supreme expression of His filial piety towards the Father, Our Lord utters a verse from Psalm 30, changing but one word of it. In place of “Lord”, Jesus says “Father”. There is in this detail a sweetness that is altogether divine. The Psalter is the tabernacle of the prayer of Jesus to the Father. The monk who makes of the psalms his daily bread will readily make satisfaction, reverently kneeling when he trips over an accent, or mispronounces a word, or sings a wrong note, not out of a morbid scrupulosity, but because he is inhabited by an immense reverence for the words by which the Word, during His life on earth, addressed His Father, and by which His Spouse, the Church, is united to His perfect prayer by day and by night.